Some days I feel like I am part of a circus, because my life is a juggling act of work, managing household tasks, keeping up with an energetic 6 year old, late nights with a newborn, and making time for my husband. I’m not complaining in the least, but there are days that I can hardly muster up the energy to do it all. I have a husband and two children who need my loving and undivided attention, so it’s much appreciative when I discover products that can simplify my life much as possible, especially one that can help keep my home clean and orderly. The Neato XV-21 Pet & Allergy Automatic Vacuum Cleaner does just that! Without lifting a finger, it vacuums at a scheduled time. It’s great for an allergy sufferer, such as myself. 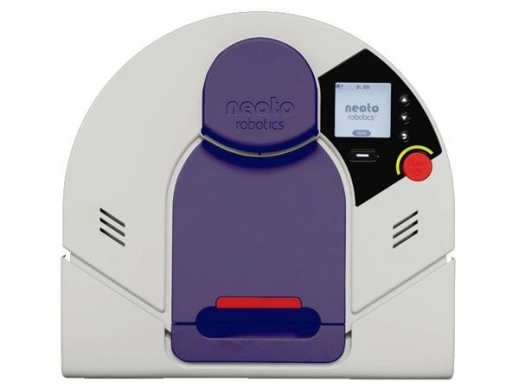 Neato XV-21 Automatic Vacuum Cleaner is specially designed for pet owners and allergy sufferers. With the most powerful suction of any automatic vacuum cleaner, the Neato XV-21 picks up dirt, debris, and even the toughest pet hair. It vacuums your floors so you don’t have to do it. • The Neato XV-21’s special filter retains more than three times the amount of fine dust particles of standard filters, which is perfect for those with allergies. • A new bristled brush improves the pick-up of pet hair, dander and fibers. • If a person or animal walks into a room, the robot will see it and make every effort to clean around it. • Neato uses a laser-distance system, giving mapping information that shows characteristics of a room (e.g. where the walls are, where furniture, and other objects are located). Don’t underestimate its intelligence, because it is constantly updated the map for any changes that could take place while it’s vacuuming. Initially, I thought it was going to be more trouble than it was worth, because it looked daunting since it looks like something from the Jetsons. I was pleasantly surprised and relieved how simple and easy it is to use. I didn’t have to assemble anything. All I had to do was find an ideal location and charge it for 2-3 hours by placing it against the charge base. You can have the vacuum programmed to clean on schedule (every day or every other day) or briefly to spot clean on the spot. Just make sure that it is fully charged. Otherwise, it will stop mid-cleaning to charge its batteries. Also, never pick it up when it’s cleaning, unless it is caught on something or gets stuck in a tricky location of your home. Picking it up for other reasons will only confuse the vacuum, so it will not be able carry on with its task. However, you can cancel its current cleaning job and move it to another room that is in dire need of attention. The Neato XV-21 isn’t like most robotic vacuums, because it has one of the most spacious dirt bins. However, you might have to run it 3-4 times before noticing a significant decrease in the amount of debris being picked up. Once you first start using it, it’s recommended that you empty it out after each cleaning since it will collect a horrendous amount of dirt. When used on a regular basis, there’s hardly any need to empty each time since your floors will be more up to par. I could hardly believe how much “gunk” that was embedded in the carpet! However, it’s worth every coin since it will do a superb job at vacuuming for you if you have other tasks to focus on. Let’s say that you have company coming over, yet you have so many other household tasks to attend to before their arrival – this will reduce the stress and amount of time to get things done. Buy It: The Neato XV-21 can be purchased at Amazon.com for $429 or at the Neato Robotics web-site. Also, they offer an Upgrade Kit ($59.99), which contains one Pet & Allergy filter and one Pet & Allergy brush. The Neato Pet and Allergy Filter Pack ($39.99) includes two Pet & Allergy filters.